Early bird deadline extended to September 22nd! Home » Early bird deadline extended to September 22nd! 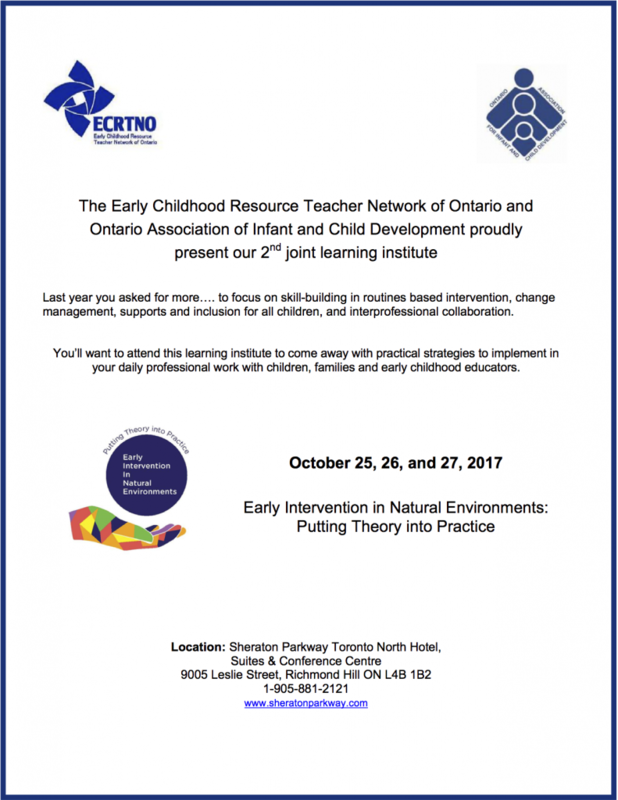 The early bird deadline for the ECRTNO-OAICD 2017 Provincial Learning Institute, Early Intervention in Natural Environments: Putting Theory into Practice, has been extended to September 22nd. Register before this date to take advantage of our early bird rates! Click below to view the amazing lineup of presenters that we’re offering this year. Be sure to scroll down and read the Important Registration Information below as well. Institute members are able to send one delegate from their agency at the membership rate. To take advantage of this opportunity, login to the registration website with the login information for your institute membership account. You must create an account. Click on REGISTER. If you wish to purchase a membership in ECRTNO or OAICD, proceed. If you want ECRTNO membership, in the top menu, click on Membership Registration and choose ECRTNO Individual or Institute. Memberships and Conference registration will take 2 payments unless you opt for Cheque payment. Proceed to payment. If no membership is desired, Click on Conferences then on Register and create your account. Note: Space is limited for Routines Based Model workshops by Cami Stevenson so register early!